Columnist for The Herald-Citizen. Speaker and author. Lover of all things Tennessee. Before you see them, you hear them. The faint melodic trilling high above your head is barely noticeable at first. You squint and scan the sky and, sure enough, there they are. Sandhill cranes, soaring more than a mile overhead as they travel to or from their winter vacation grounds. Most of the tens of thousands of cranes flying over our part of the world migrate from the frigid north all the way to Georgia or Florida to spend the winter. 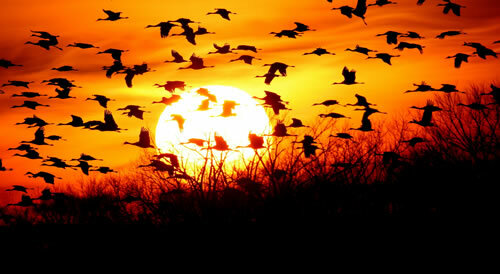 But–lucky for us!–several thousand choose to stop and stay at the Hiwassee Wildlife Refuge in southeast Tennessee. For years, I’d vowed to visit. Last weekend, I finally did. The Hiwassee Refuge is located at the confluence of the Tennessee and Hiwassee rivers near Birchwood, Tennessee. It’s been managed by the Tennessee Wildlife Resources Agency (TWRA) as a waterfowl refuge for more than 60 years. Beginning in the early 1990s, the recovering population of Sandhill cranes began stopping for a rest at Hiwassee on their way further south. Some decided the spot was so perfect that there was no need to continue the trip. Nowadays, according to TWRA estimates, more than 12,000 Sandhill cranes spend the entire winter at the Hiwassee Refuge. Sandhill cranes are the oldest known surviving North American bird species. Fossils as ancient as two-and-a-half million years have been discovered in the Midwest. The cranes are also exceptionally tasty. Legend has it that, along with (or perhaps instead of) wild turkeys, Sandhill cranes graced the Pilgrims’ dinner table at the first Thanksgiving. Lewis and Clark reported feasting on Sandhill cranes on their grueling journey west. By the beginning of the 20th century, overhunting and loss of habitat had resulted in near-decimation of the eastern population of Sandhill cranes. By the 1930s, only 25 breeding pairs remained. Happily, stringent wildlife management allowed the species to rebound. Today, it’s estimated that more than 100,000 Sandhill cranes live and thrive in the eastern United States. They mate for life and breed in early spring. Both parents build the nest and incubate the eggs, usually two per family. Chicks, covered in down and with eyes open, hatch after 30 days. They’re able to leave the nest within hours after birth but will remain under their parents’ care for nine or ten months. Meaning that, in the fall, the adolescent birds will accompany their mom and dad on the long flight south. They’ll join with thousands of other cranes to form survival groups and will search for resting places with sufficient food—including cultivated crops such as corn, wheat and sorghum—and an abundance of shallow water. Sometimes, they’ll find a rest stop so wonderful that they’ll decide to stay put until spring. Someplace, for example, like the Hiwassee Refuge. It’s not too late to see them there. Though this year’s Sandhill Crane Festival is history, the refuge viewing platform is open to the public year round. Take a lawn chair, a thermos of hot coffee and a pair of good binoculars and settle in for an amazing show. Gaze in wonder as huge flocks of cranes circle and land on the muddy bottomland. Gasp at their huge wingspan (five to six feet) and impressive height (three to four feet). Note the crimson caps on their heads. Get lost in the magic of their music. But don’t delay. Come late February, the lengthening of the days will cue the cranes that it’s time to leave. Then the only way you’ll be able to see them is as tiny dots, soaring a mile above your head on their way back north. Where the whole sacred cycle will begin again. You did an excellent job of showing us he Cranes and the awe they produced in you. They awe me every time I see them flying or on the ground. Keep up the good work.